Now that Dad’s turned 50 he’s starting to think like a hippie. That’s the only explanation I have for him asking me to join him on the Critical Mass bike ride. Never heard of it? You’re not the only one. 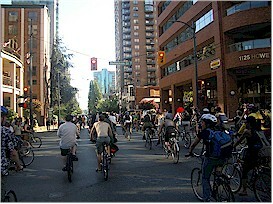 Picture this: a sea of bikes and bikers, some decorated and in costume, riding through the streets of Vancouver city taking up all the room so cars can’t move. Believe it or not, it's fun. My first thought was, I hope nobody I know sees me, but before I knew it I was a part of it, and I didn’t care whether anybody saw me or not. Dad and I went in June; that’s bike month. It was a Friday night and the weather was perfect. Apparently the turn-out was unprecedented. 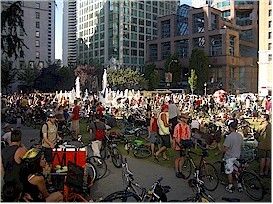 I remember looking around me at the Vancouver Art Gallery (where the ride starts) and thinking, “Wow, look at all these people,” and that wasn’t everybody, because a bunch more joined us along the way. The route is a mystery. It seems like we’re just going anywhere, but I saw some people handing out fliers and information sheets so it must be more organized than it looks. Needless to say once we took to the streets no car could get by us. They have people called “corkers” stationed at intersections making sure no unwitting motorists get any bright ideas. We got mixed reactions from drivers: some cheered us on, while others hit the roof. Let me tell you, there were a couple cases of road rage that were not a pretty sight. One lady thought she could plow through a thick stream of bikers—guess again! Her misguided notion got shot down pretty fast when 20 bikers surrounded her car and banged it up pretty good. 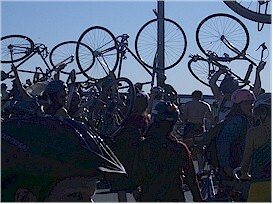 Don’t get me wrong; Critical Mass is not a bunch of rowdy people trying to irritate motorists. I saw lots of families getting in on it. 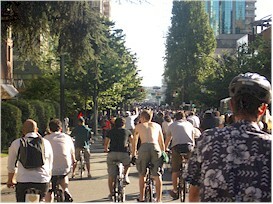 Critical Mass is a peaceful demonstration of the power numbers can have. The message is, “Stop and think about the environmental impact of all those gas-guzzling, smoke-spewing cars, and think about another way of getting to wherever you’re going. If you’re in the mood for something totally different, look into a Critical Mass rally. 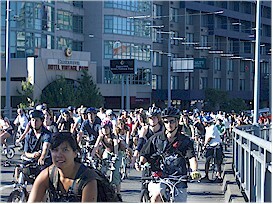 It’s the only chance you’ll ever get to ride down the middle of the Burrard Street Bridge on a bike with a hundred motorists watching you (and gritting their teeth).